Own The Godfather - Part II DVD from Deff, DVD, Blu-Ray & 4K Video Specialists - Free UK Delivery..
See this famously dark, staggeringly beautiful trilogy of films presented by the filmmaker as originally envisioned for the cinema. Four discs including all three films and over 4 hours of supplemental materials. The Godfather and The Godfather: Part II fully restored with all-new 5.1 Dolby True HD sound The Godfather: Part III newly remastered. A true cultural phenomenon. 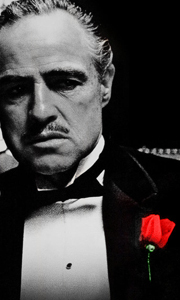 The Godfather Trilogy is the benchmark for all cinematic sto..
See this famously dark, staggeringly beautiful trilogy of films presented by the filmmaker as originally envisioned for the cinema. Five discs including all three films and over 4 hours of supplemental materials. The Godfather and The Godfather: Part II fully restored with all-new 5.1 digital surround sound The Godfather: Part III newly remastered. A true cultural phenomenon. The Godfather Trilogy is the benchmark for all cinematic sto..
Own The Godfather - The Don Mug from Deff, DVD, Blu-Ray & 4K Video Specialists - Free UK Delivery.. Regarded as one of the best American films ever by the American Film Institute, Francis Ford Coppola's epic masterpiece features Marlon Brando in his Oscar - winning role as the patriarch of the Corleone family. The Godfather is a violent and chilling portrait of the Sicilian family's struggle to stay in power in a post-war America of corruption, deceit and betrayal. Coppola begins his legendary trilogy, masterfully balancing the story .. In what is undeniably one of the best sequels ever made, Francis Ford Coppola continues his epic Godfather trilogy with this saga of two generations of power within the Corleone family. Coppola, working once again with author Mario Puzo, crafts two interwoven stories that work as both prequel and sequel to the original. One shows the humble Sicilian beginnings and New York rise of a young Don Vito, now played in an Oscar-winning perform.. In the final installment of the epic Corleone trilogy, Al Pacino reprises his role as powerful family leader Michael Corleone. Now in his 60s, Michael is consumed with guilt for his past deeds while he plans his family’s re-emergence as a completely legitimate corporation in this exciting, long-awaited film. Masterfully exploring the themes of power, tradition, revenge and love, Francis Ford Coppola directs Pacino, Andy Garcia, Diane Ke.. In the final instalment of the epic Corleone trilogy, Al Pacino reprises his role as powerful family leader Michael Corleone. Now in his 60's, Michael is consumed with guilt for his past deeds while he plans his family's re-emergence as a completely legitimate corporation in this exciting, long-awaited film. Masterfully exploring the themes of power, tradition, revenge and love, Francis Ford Coppola directs Pacino, Andy Garcia, Diane Ke.. The Godfather The Godfather II The Godfather III..